New Moderate Iran Launches Massive War Drills Codenamed "Towards Jerusalem"
Launching these drills while negotiations with the Western powers are going on is the height of arrogance and cynicism: the mullahs know that the West is anxious to capitulate to them, and are gleefully poking Obama and Co. in the eye, knowing that they can do whatever they want and nothing will ever be done to call them to account. (Washington Free Beacon)—Iranian military forces launched a series of "massive military drills" across nine provinces on Wednesday following an order by Supreme Leader Ayatollah Ali Khamenei, according to state media reports. The drills, codenamed "Towards Jerusalem," will continue over the coming days and throughout the rest of the year. At least three battalions of Iran's "fast reaction" Basij Force participated in the drills, which come as Western nations and Iran try to finalize a deal aimed at halting the country's contested nuclear program. A lieutenant commander of one of the volunteer fighting battalions said that the drills are meant to show off Iran's ability to confront enemies at key points across the country, according to Iran's state-run Fars News Agency. 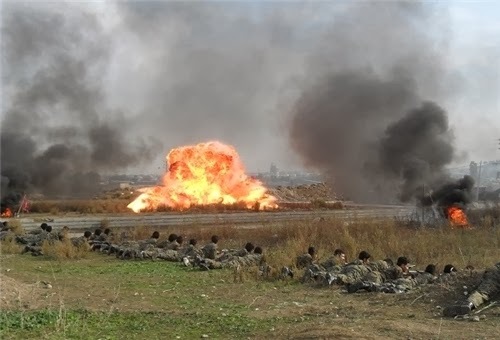 "The main purpose for these war games is to retain preparedness and increase the combat capability of the forces to confront any possible move by domestic and foreign enemies," Hossein Karimi, lieutenant commander of the Golestan's Neynava Corps, was quoted as saying. Additional fighting brigades will enter the war games over the next few days and at other points throughout the year, according to Karimi. State-run media published multiple pictures of the armed Iranian forces battling through explosions and taking enemy forces hostage. Meanwhile, Iran and world powers inch closer to a nuclear deal that could allow Tehran to continue its nuclear enrichment program. Tehran has called its ability to enrich a "redline" and new reports indicate that the issue is not even being considered in an interim deal, the details of which have been kept mostly quiet. One of Iran's lead negotiators reiterated that Iran would not sign any deal that seeks to halt its enrichment program. "No agreement will be accepted in which enrichment doesn't exist from the very beginning to the end," Iranian negotiator Seyed Abbas Araqchi was quoted as saying early Thursday. Discussions on a draft final agreement are scheduled to take place all day Thursday.